Here at Kiwi Box we often have customers coming to us with very little knowledge of refrigerated containers and what services we offer. Our customers generally contact us with a refrigeration or storage problem and through a series of questions and answers we get to know them and their requirements. We then discuss their options and work towards providing a tailored and cost-effective solution that best suits their needs. Today we’d like to cover five of the most common questions we asked by those looking to lease a refrigerated container. 1. Do I need a single-phase or three-phase container? We offer both single-phase and three-phase containers at Kiwi Box. Simply put, the difference between the two is their ability to chill or freeze the stock you are storing. A single-phase refrigerated container is cheaper to run but will not provide the same chilling or freezing power as a three-phase refrigerated container. We recommend you go for a three-phase container if you require heavy-duty chilling or freezing, and a single-phase container if you want a cheaper option to run as a lighter-duty chiller or for storing products that are already frozen. If you’d like to get technical, geek out on the differences between single-phase and three-phase power supplies here. 2. How much does a refrigerated container cost to run per day? – What duty will I be asking of the container? – What temperature is the product I’m going to store at the time of going into the container, and what temperature do I need to chill or freeze it down to? If it arrives prechilled or already frozen, it will put less demand on the container to get the product to the right temp. – What are the power rates where I’m going to be running my refrigerated container?It’s only with answers to these questions that you can start to estimate your daily running costs. – Will I be going in and out of the container all day, putting more demand on the chilling/freezing system, or will I be opening the doors only once or twice a day? 3. 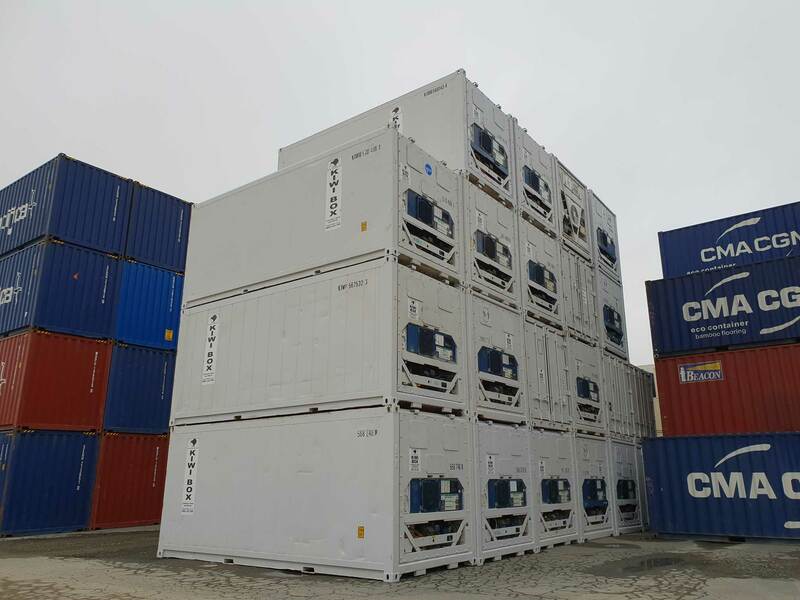 What’s the shortest amount of time a container can be leased for and how much will it cost? We have a minimum lease period of one month. The cost of leasing depends on how long you will require the container… the longer you have it, the less it will cost you per day. 4. How soon can I get a refrigerated container delivered and how much will it cost? Once we’ve discussed all your options and you’ve decided on a specific model, placed an order and signed a lease agreement, we can usually get a Kiwi Box refrigerated container on the road to you within 12 to 24 hours. The cost of the delivery will depend on how far away from your nearest depot you are located. We always provide our customers with a delivery quote before they sign an agreement, so they can consider the cost in their budget. 5. Who will fix the leased refrigerated container in the event of a breakdown? Part of our dedication to our customers is the 24/7 breakdown service we offer at no additional cost. Our team of highly skilled technicians carry out scheduled maintenance inspections throughout the year to prevent any potential issues before they eventuate, and in the unwelcomed event of a breakdown, we take care of all repairs. We hope these common questions have helped you learn more about how our containers can answer your business’s refrigerated storage needs. If you’d like to learn more about what we offer and how we can be of assistance, take a look around our website and feel free to get in touch.